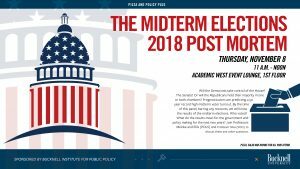 We encourage you to join us on Thursday, November 8 from 11:00am – 12:00pm in the Academic West Event Lounge on the 1st floor for a Pizza and Policy Forum on The Midterm Elections 2018 Post Mortem. Will the Democrats take control of the House? The Senate? Or will the Republicans hold their majority in one or both chambers? Prognosticators are predicting a 50 year record high midterm voter turnout. By the time of this panel, barring any recounts, we will know the results of the midterm elections. Who voted? What do the results mean for the government and policy making for the next two years? Join Professors Meinke and Ellis (POLS) and Professor Silva (SOCI) to discuss these and other questions.